Bloom's Taxonomy was created in 1956 under the leadership of educational psychologist Dr Benjamin Bloom in order to promote higher forms of thinking in education, such as analyzing and evaluating concepts, processes, procedures, and principles, rather than just remembering facts (rote learning). It is most often used when designing educational, training, and learning processes. Since the work was produced by higher education, the words tend to be a little bigger than we normally use. Domains may be thought of as categories. Instructional designers, trainers, and educators often refer to these three categories as KSA (Knowledge [cognitive], Skills [psychomotor], and Attitudes [affective]). This taxonomy of learning behaviors may be thought of as “the goals of the learning process.” That is, after a learning episode, the learner should have acquired a new skill, knowledge, and/or attitude. While the committee produced an elaborate compilation for the cognitive and affective domains, they omitted the psychomotor domain. Their explanation for this oversight was that they have little experience in teaching manual skills within the college level. However, there have been at least three psychomotor models created by other researchers. Their compilation divides the three domains into subdivisions, starting from the simplest cognitive process or behavior to the most complex. The divisions outlined are not absolutes and there are other systems or hierarchies that have been devised, such as the Structure of Observed Learning Outcome (SOLO). 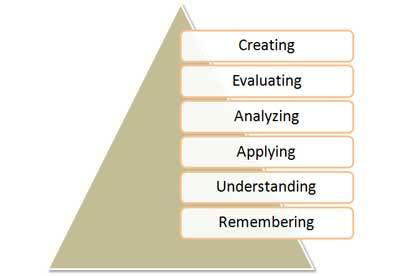 However, Bloom's taxonomy is easily understood and is probably the most widely applied one in use today. Remembering: Recall or retrieve previous learned information. Examples: Recite a policy. Quote prices from memory to a customer. Recite the safety rules. Understanding: Comprehending the meaning, translation, interpolation, and interpretation of instructions and problems. State a problem in one's own words. Examples: Rewrite the principles of test writing. Explain in one's own words the steps for performing a complex task. Translate an equation into a computer spreadsheet. Applying: Use a concept in a new situation or unprompted use of an abstraction. Applies what was learned in the classroom into novel situations in the work place. Examples: Use a manual to calculate an employee's vacation time. Apply laws of statistics to evaluate the reliability of a written test. Analyzing: Separates material or concepts into component parts so that its organizational structure may be understood. Distinguishes between facts and inferences. Examples: Troubleshoot a piece of equipment by using logical deduction. Recognize logical fallacies in reasoning. Gathers information from a department and selects the required tasks for training. Evaluating: Make judgments about the value of ideas or materials. Examples: Select the most effective solution. Hire the most qualified candidate. Explain and justify a new budget. Creating: Builds a structure or pattern from diverse elements. Put parts together to form a whole, with emphasis on creating a new meaning or structure. Examples: Write a company operations or process manual. Design a machine to perform a specific task. Integrates training from several sources to solve a problem. Revises and process to improve the outcome. 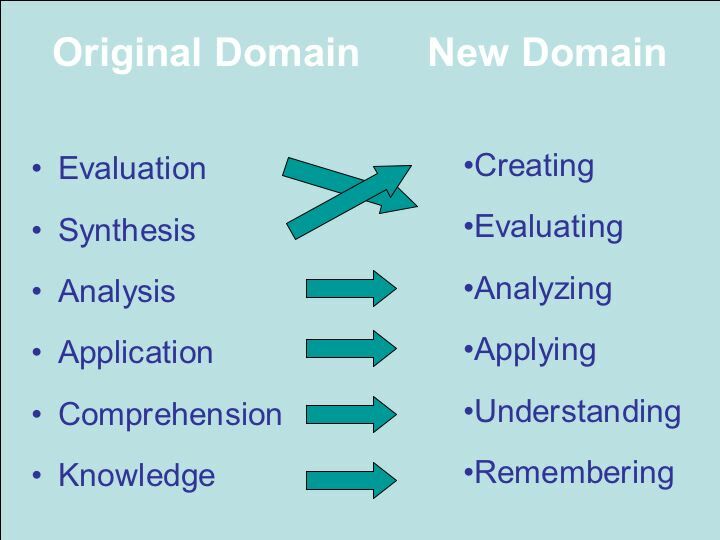 Bloom's Revised Taxonomy not only improved the usability of it by using action words, but added a cognitive and knowledge matrix. Factual - The basic elements students must know to be acquainted with a discipline or solve problems. Conceptual – The interrelationships among the basic elements within a larger structure that enable them to function together. Procedural - How to do something, methods of inquiry, and criteria for using skills, algorithms, techniques, and methods. 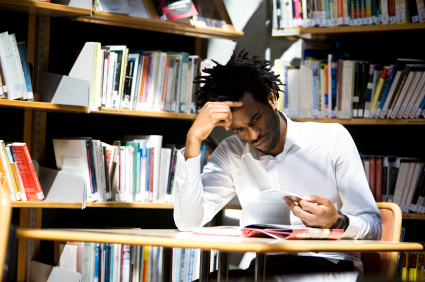 Metacognitive – Knowledge of cognition in general, as well as awareness and knowledge of one’s own cognition. Facts - Specific and unique data or instance. Concepts - A class of items, words, or ideas that are known by a common name, includes multiple specific examples, shares common features. There are two types of concepts: concrete and abstract. Processes - A flow of events or activities that describe how things work rather than how to do things. There are normally two types: business processes that describe work flows and technical processes that describe how things work in equipment or nature. They may be thought of as the big picture, of how something works. Procedures - A series of step-by-step actions and decisions that result in the achievement of a task. There are two types of actions: linear and branched. Principles - Guidelines, rules, and parameters that govern. It includes not only what should be done, but also what should not be done. Principles allow one to make predictions and draw implications. Given an effect, one can infer the cause of a phenomena. Principles are the basic building blocks of causal models or theoretical models (theories). Anderson, L.W., Krathwohl, D.R., Airasian, P.W., Cruikshank, K.A., Mayer, R.E., Pintrich, P.R., Raths, J., Wittrock, M.C. (2001). A Taxonomy for Learning, Teaching, and Assessing: A revision of Bloom's Taxonomy of Educational Objectives. New York: Pearson, Allyn & Bacon. Bloom, B.S. (Ed.). Engelhart, M.D., Furst, E.J., Hill, W.H., Krathwohl, D.R. (1956). Taxonomy of Educational Objectives, Handbook I: The Cognitive Domain. New York: David McKay Co Inc.
Clark, R., Chopeta, L. (2004). Graphics for Learning : Proven Guidelines for Planning, Designing, and Evaluating Visuals in Training Materials . San Francisco: Jossey-Bass/Pfeiffer. Updated January 12, 2015. Created June 5, 1999.